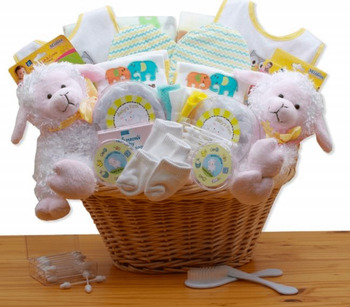 Our Deluxe Little Lamb Twins Basket is a perfect neutral colored gift for the parents who prefer to keep gender a surprise. This attractive ensemble is a sweet way to welcome the new babies! Arrives nicely wrapped in cellophane and topped with a handmade bow. Gift dimensions are 16" long by 12" wide and 14"